Acute movement disorder associated with symmetrical basal ganglia lesions occurring in the background of diabetic end stage renal disease is a recently described condition. It has distinct clinico-radiological features and is commonly described in Asian patients. We report the first Indian case report of this potentially reversible condition and discuss its various clinico-radiological aspects. Diabetic end stage renal disease (ESRD) presenting with altered alertness and awareness is a well-recognized condition. In contrast to this, the syndrome of acute onset movement disorder associated with bilateral basal ganglia lesions is a rare form of central nervous system involvement. It was first described by Wang et al., in 1998 who reported on three patients. Since then 24 additional cases have been described (including the present case). ,,,,,,,,, Twenty three of the reported patients are Asians, three are Caucasians, and one is Hispanic. A 67-year-old Indian man presented with two days history of acute onset generalized dyskinesia associated with mild confusional state. He had an 18 years history of type 2 diabetes mellitus causing ESRD, which was being treated with twice weekly hemodialysis for the last four years. There was no history of recent hypoglycemic or hypotensive episodes. He had no past or family history of movement disorders. Physical examination revealed a blood pressure of 140/80 mm Hg. He was conscious but presented mild confusion. He had moderately severe generalized chorea, which dominantly affected the acral parts of the limbs and the oro-facial region. There was no evidence of Parkinsonism More Details, asterixis, or myoclonus. Laboratory investigations revealed evidence of uraemia and mild metabolic acidosis. Blood urea level was 141 mgm% (normal: 10.0 to 39.0 mgm%) while creatinine was 8.0 mgm% (normal: 0.5 to 1.4 mgm%). Serum bicarbonate was 19.2 mMol/L (normal: 24.0 to 36.0 mMol/L). Other variables included a haemoglobin level of 9.8 Gms% (normal: 12.0 to 14.0Gms%), blood sugar level of 140 mgm% (normal: 70 to 110 mgm%), serum calcium 7.9 mgm% (normal: 8.5 to 10.1 mgm%) and phosphorus 9.8 mgm% (normal: 2.5 to 4.5 mgm%). Serum pottasium was raised to 5.7 mEq/L (normal: 3.0 to 5.0 mEq/L) while serum sodium remained normal at 134 mEq/L (normal: 130 to 145 mEq/L). Serum venous lactate, serum iron and total iron binding capacity were normalSerum parathormone level was also normal. Magnetic resonance imaging (MRI) scan of the brain was performed using a 1.5-Tesla machine. The T1-weighted images showed bilateral symmetrical low signal intensity in the basal ganglia, while the T2-weighted and fluid attenuation inversion recovey FLAIR images showed increased signal intensities in the same regions. The DW 1 images (b-values =500 s/mm 2 ) showed increased signal intensities in bilateral basal ganglia along with decreased apparent diffusion coefficientADC values in the central portions of the basal ganglia surrounded by increased ADC values in their peripheral portions [Figure 1]. The patient was advised oral clonazepam at a dose of 0.25 mgm thrice daily for symptomatic control of the movement disorder. However, he did not take the medication due to an apprehension that it is a "sleeping" tablet and may harm him. Concomitantly, the frequency of hemodialysis was increased to three times per week. The confusional state cleared off within four days and the movement disorder disappeared completely within 15 days. At this stage the blood urea had reduced to 82 mgm% and the serum creatinine was 5.2 mgm %. He was not administered any other drug like steroids. He has remained stable without the movement disorder during a six months follow-up. Repeat MRI scan of the brain performed three months after the first scan showed near total clearance of the basal ganglia BG lesions. No evidence of residual damage was seen [Figure 2]. A review of the published reports of diabetic ESRD reveals that the presenting movement disorder is either parkinsonism without rest tremors or generalized chorea. A single case has been reported who had both the movement disorders co-existing. Other less common neurological features have included mild confusional state, gait disturbances, dysarthria, and dysphagia. Our patient had mild confusional state in addition to the generalized movement disorder, which possibly indicates the presence of mild cortical dysfunction. Neuroimaging findings are a hallmark of this condition. Computerized tomography and magnetic resonance imaging usually reveal selective damage to the bilateral basal ganglia and in some cases the surrounding white matter. Our patient underwent detail MRI study using the DW images in addition to the standard T1- and T2-weighted images. There was evidence of central area of cytotoxic oedema surrounded by vasogenic oedema in the affected regions. Similar observations were made by Kim et al. and Lee et al. The former authors also reported on irreversible cystic degeneration in the medial areas of the basal ganglia. As observed in our patient, the basal ganglia lesions disappeared in majority of the reported cases when the scans were repeated within 3 weeks to 2 months. A F-18 fluorodeoxyglucose positron emission tomography (FDG-PET) study performed in 2 cases by Wang et al.,  demonstrated grossly decreased glucose metabolism in the basal ganglia, especially in the putamen. Decrease in cortical metabolism involving the frontal and occipital regions was also identified. They postulated that these patients have already compromised cellular function due to long term diabetes through microangiopathic changes or energy utilization failure. During long term exposure to toxic and metabolic insult, the cellular metabolism and or vasogenic autoregulation collapses leading to tissue damage and edema. This altered physiology leads to the occurrence of movement disorders. On this basis we presume that our patient had tissue edema involving the basal ganglia region, and thus, total recovery without residual damage. Our patient showed complete clinical recovery from the neurological disorder within 2 weeks after increasing the frequency of haemodialysis. Repeat MRI performed 3 months after the first one showed near total resolution the basal ganglia lesions. Reports from the published literature show that the clinical recovery may be complete in 20% cases, partial recovery with residual deficits in 50% of cases, and no recovery in 30% cases. Radiological recovery is seen in nearly 90% cases. Although the recovery pattern for the neurological syndrome is generally good the overall outcome for such patients is poor. Early mortality due to complications like sepsis, comorbid cardiovascular disorders, and metabolic complications is observed. In summary, we report the first Indian case of acute movement disorder and bilateral basal ganglia lesions in diabetic uremia. We presume that this condition may not be uncommon in our country. Increased awareness about this potentially reversible neurological condition may help us recognize more such cases. 1. Wang HC, Brown P, Lees AJ. Acute movement disorders with bilateral basal ganglia lesions in uremia. Mov Disord 1998;13:952-7. 2. Hung SC, Hung SH, Tang DC, Yang WC, Huang TP. Chorea induced by thiamine deficiency in haemodialysis patients. Am J Kidney Dis 2001;37:427-32. 3. Cheng SJ, Hsuch JH, Po HL, Huang JK, Tzen CY, Huang RC. Neuroimaging characteristics of basal ganglia lesions in diabetic patients: Correlation with clinical features. Acta Neurologica Taiwana 2001;10:14-20. 4. Wang HC, Cheng SJ. The syndrome of acute bilateral basal ganglia lesions in diabetic uremic patients. J Neurol 2003;250:948-55. 5. Wang HC, Hsu JL, Shen YY. Acute bilateral basal ganglia lesions in patients with diabetic uremia:An FDG-PET study. Clin Nucl Med 2004;29:475-8. 6. Lee YH. Diabetic nephropathy with symmetrical changes in the basal ganglia regions. Clin Radiol 2005;60:815-20. 7. Cupidi C, Piccoli F, La Bella V. Acute reversible parkinsonism in a diabetic uremic patient. Clin Neurol Neurosurg 2006;108:601-3. 8. Kim TK, Seo SI, Kim JH, Lee NJ, Seol HY. Diffusion weighted magnetic resonance imaging in the syndrome of acute bilateral basal ganglia lesions in diabetic uremia. Mov Disord 2006;21:1267-70. 9. Lee EJ, Park JH, Ihn Y, Kim YJ, Lee SK, Park CS. 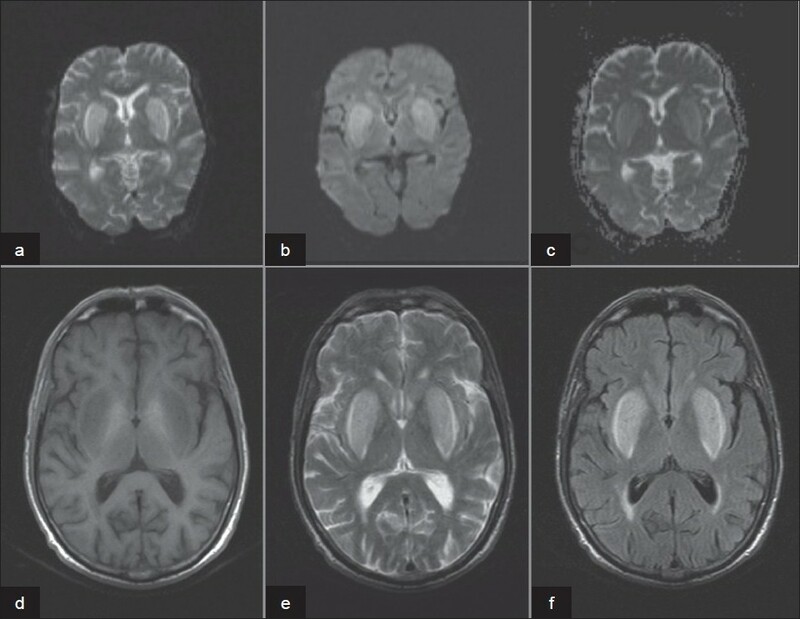 Acute bilateral basal ganglia lesions in diabetic uremia: Diffusion weighted MRI. Neuroradiology 2007;49:1009-13. 10. Li JY, Yong TY, Sebben R, Khoo E, Disney AP. Bilateral basal ganglia lesions in patients with end-stage diabetic nephropathy. Nephrology (Carlton) 2008;13:68-72. 11. Kiryluk K, Khan F, Valeri A. Acute chorea and bilateral basal ganglia lesions in a haemodialysis patient. Kidney Int 2008;73:1087-91.